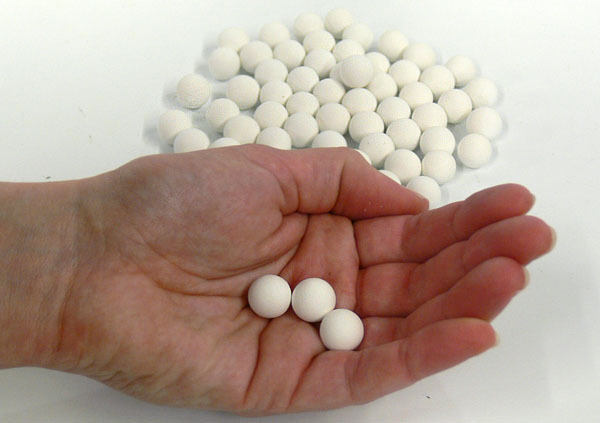 Ball Mills are a very efficient tool for grinding many materials into a fine powder. 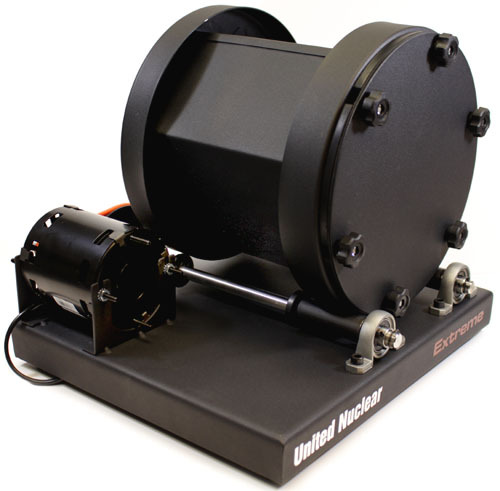 Smaller table-top Ball Mills such as ours are useful for grinding granular materials with a particle size up to about 1/4" into a fine dust. 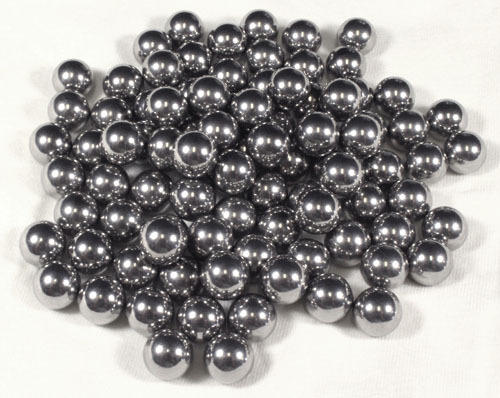 There are some materials that our Ball Mills can grind into a powder even if the particle size is very large, like charcoal and similar products that will crush easily. Generally speaking though, for grinding larger chunks of hard material, with particles 3/4" and up, a Rock Crusher is typically used. The larger diameter the ball mill, the larger particle size it will handle and the more aggressive the milling will be. The rule of thumb is if you can grind the material into a powder using a mortar & pestle, a Ball Mill will most likely work for the purpose. 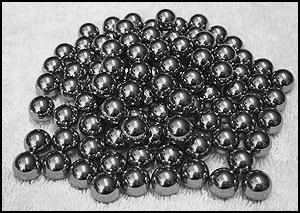 Ball Mills work by employing various types of media (either steel, ceramic or lead balls) to crush the material in the barrel. To use the Mill, the material to be ground is loaded into the barrel which contains grinding media. 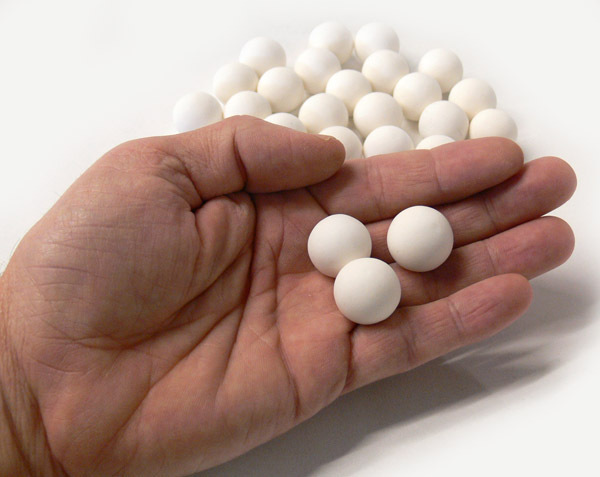 As the barrel rotates, the material is caught between the individual grinding media balls which mix and crush the product into a very fine powder over a period of several hours. Quite simply, the longer the Ball Mill is run, the finer powder will be. 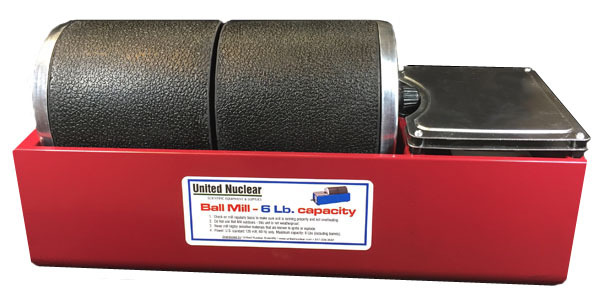 Ultimate particle size depends entirely on how hard the material you're grinding is, and how long the Ball Mill is run. 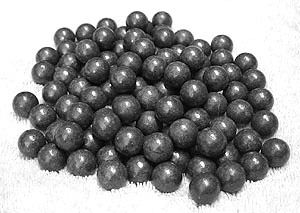 Our Ball Mills have been used by thousands of customers for powdering various chemicals, making black powder & rocket propellant, grinding glass, making custom varnishes & ceramic glaze, etc. Media Choice: The best overall choice for grinding media is Stainless Steel. Due to its fairly high mass and hardness, it grinds chemicals & powders quickly and efficiently with minimal contamination. 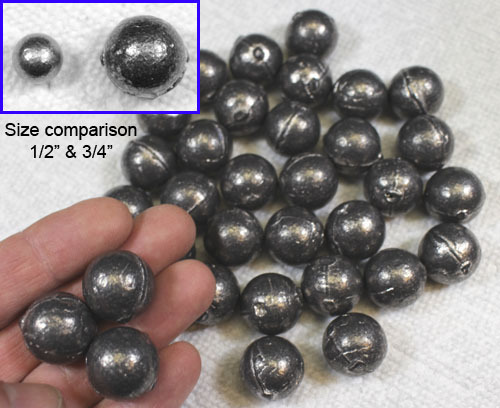 If you are milling Black Powder or Rocket Propellant, then Lead or Antimony are the only media choices you can use as they are completely non-sparking. Lead & Antimony are both an extremely high mass grinding media but are somewhat soft, which causes some contamination to the material being milled. In pyrotechnic materials this is not a concern. If you plan on grinding very hard materials (such as Glass particles) it is recommended that you use Stainless Steel or Chrome Steel media as they are both hard and heavy. When grinding Glass and similar hard substances, your starting material should be about as coarse as ordinary sand. The Ball Mill with then reduce it to a fine powder. 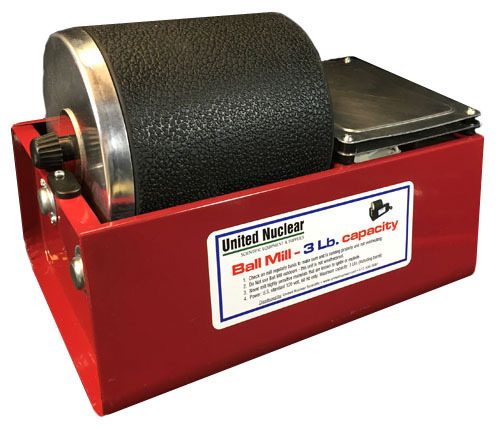 Due to its small barrel diameter and lower impact energy, Ball Mills with small diameter barrels such as our 3 Lb or 6 Lb mills are not suitable for grinding Glass or similar hard materials. Ceramic media is a good choice when you must keep your media contamination to an absolute minimum and is ideal for milling individual chemicals. However, because of its light weight, ceramic media can take considerably longer to produce desired results. 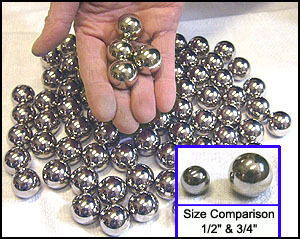 Stainless steel is also an excellent choice where media contamination must be kept to a minimum. 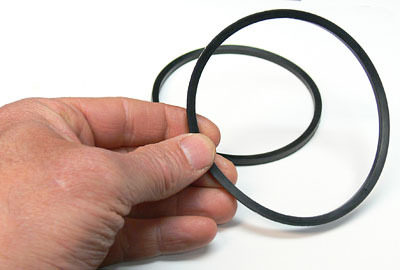 Replacement Drive Belts for our 3 Lb Capacity and 6 Lb Capacity Ball Mills. Pack of 4 belts. 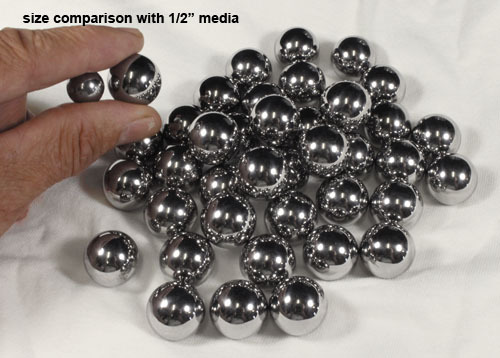 Antimony Alloy (12%) Grinding Media, 1/2"
Chrome Plated Steel Grinding Media, 1/2"
Approximately 1/2" diameter, heavy chrome plated Steel Ball Bearings. 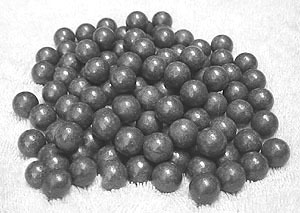 Use in place of Lead balls where you don't want any contact with Lead or if you're planning on grinding very hard materials. Package of 100. Stainless Steel Grinding Media, 1/2"
Stainless Steel Grinding Media, 3/4"